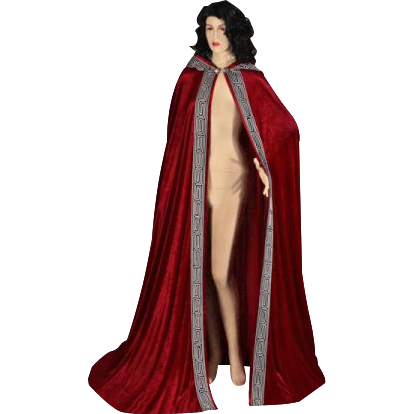 The Velour Medieval Hooded Cloak is a sleek cloak that is made from a luxurious velour fabric. This fabric has the same shine and feel of crushed velvet, but comes in a much lighter-weight fabric, so this cloak is not overly heavy or weighty. The hood of this cloak is lined in satin, making it quite comfortable to wear too. The cape is available in a variety of vibrant colors and features a white-gray medieval-styled border along the hood and the inner hems. The cloak is also available in a variety of sizes. The Velour Medieval Hooded Cloak is a great item to add to almost any medieval costume, it adds character to any medieval or renaissance look, and adds an additional layer of insulation during the colder months.